Heat oil in stock pot or kettle. Cook onions until golden. Add remaining sauce ingredients. Bring to boil. Decrease heat and simmer for 30 minutes. Use 2" deep hotel pans. Divide turkey and sauce evenly into each pan. Cover and heat in a 350° F oven for 30-45 minutes. Mix mayonnaise, milk, sugar, vinegar, and cayenne to make dressing. Toss dressing with cabbage slaw, jalapeno, and cilantro. For each serving, put 1 c. ( 2 #8 scoops) cooked rice into a bowl. 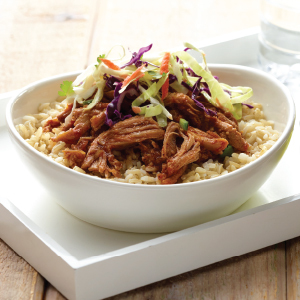 Place a #8 scoop of turkey on the rice and top with a #16 scoop of cabbage slaw. MEASURE: ¼ c. 3 tbsp. MEASURE: ¼ c. 1 tbsp. 1 serving provides 2 oz. meat/meat alternate, 2 oz. bread/grain equivalent, ¼ c. vegetable. Oil, vegetable ¼ c. ½ c.
Onions, diced 1 lb. 11 oz. 3 lbs. 6 oz. Ketchup 2 ½ c. 1 qt. 1 c.
Vinegar, distilled ½ c. 2 tbsp. 1 ¼ c.
Sugar, brown, packed ½ c. 2 tbsp. 1 ¼ c.
Mustard, dry 2 tbsp. ¼ c.
Cumin, ground 2 tbsp. ¼ c.
Paprika 2 tbsp. ¼ c.
Chipotle chili powder 3 ½ tbsp. ¼ c. 3 tbsp. Chicken stock, reduced sodium 2 ½ c. 1 qt. 1 c.
Water 1 ½ c. 3 c.
Mayonnaise 1 ¼ c. 2 ½ c.
Milk, low-fat. 1% 1 ¼ c. 2 ½ c.
Sugar, granulated 2 ½ tbsp. ¼ c. 1 tbsp. Vinegar, distilled 2 ½ tsp. 1 tbsp. 2 tsp. Cayenne pepper, ground ¾ tsp. 1 ½ tsp. 3 color shredded coleslaw mix 2 lbs. 4 lbs. Jalapeno pepper, fresh, finely chopped 1 -2 ea. 3-4 ea. Cilantro, chopped 2 ½ c. 1 qt. 1 c.